WhatsApp recently rolled out much-requested sticker support for Android. While you can get a range of stickers for WhatsApp by either searching within the application (appears next to the existing emoticon and gif option) or by installing it through third-party sticker Apps like these. 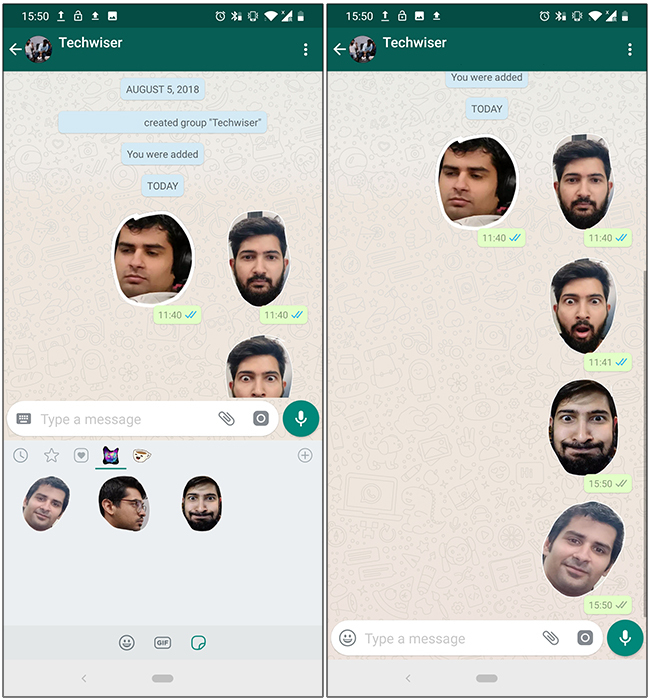 But wouldn’t it be awesome, if we can create our own personal stickers on WhatsApp? Essentially Stickers work pretty much like emoticons, i.e. they are just PNG images with a transparent background which look cool on the chat thread. This raises an interesting question; if stickers are just regular png images, why can’t we create our own custom stickers? Well, turns out, you can. In fact, there is more than one way in which you can install custom stickers on WhatsApp. Let’s check them out. 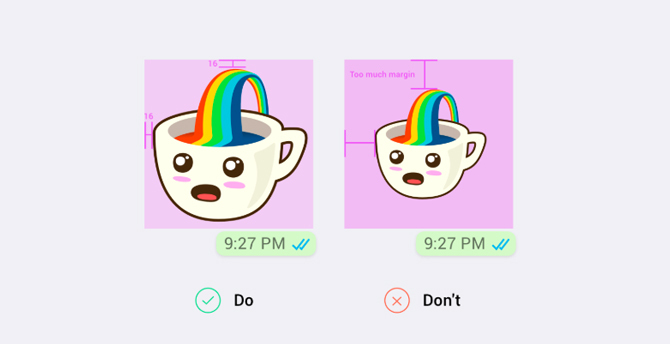 To make sure users don’t abuse the Stickers feature with hastily cropped images, WhatsApp only allows users to add stickers to chats via third-party apps. WhatsApp also released a sample app to help developers make their own stickers app for Android and iOS. You can read more about the guidelines on their FAQ page and download the sample apps from this link. If you are a developer or know a little bit about coding, you can create your own custom app to install stickers on the Play Store. However, for most of you, it would be too complicated, which bring us to our next method. Bobble Keyboard has adopted the functionality of creating stickers and uploading it to WhatsApp directly from the app. Earlier, we had to go through a lengthy process of editing the stickers then convert those into the correct format and then use another app to upload it to WhatsApp. Now, the app does all the work and makes the whole process seamless. With this app, you can create custom stickers with your face. The app generates an animated avatar of your face and puts it over pre-designed stickers. You can adjust the facial features of your avatar and directly add the stickers to WhatsApp with a tap. The app is free on the Play Store. We will use Create Stickers for WhatsApp. Install it on your phone by tapping the link above. To create your sticker, go to the app and select an image from the gallery. You can create a collage style sticker using existing images and emojis. Once you select an image, it takes you to the crop window and you can adjust the orientation and crop the image. After that, it loads up the editor in which you can make changes and tweak the image. You get a brush tool, text box, filters, and emojis. Use these to customize your creations and create unique stickers. After editing the image, press the tick icon to see the preview of the sticker. You get an option to add a custom shape to the sticker which adds another layer to exclusivity to your stickers. Now press Add to WhatsApp to add the stickers to WhatsApp. Viola, now your stickers appear on WhatsApp. The only problem with this method is that you get a limited number of stickers after you exhaust the limit, you can either buy a pack or watch an ad to get a few stickers. If you are looking for a one-click solution to sent custom stickers on WhatsApp, then use newly released Sticker maker for WhatsApp. Though, make sure you update your WhatsApp version from the Google Play Store. Once updated go to WhatsApp and open any chat and tap on the emoji icon on the bottom right, if you don’t see the sticker icon you may have to wait for a few more days before you can create your own stickers for WhatsApp. Go to the Play Store and download Sticker maker for WhatsApp. It is free and lets you create stickers from virtually any image. After the app is downloaded, open it and tap on create a new sticker-pack button. You can set the title and the author of the sticker pack and press create after entering the details. After you’ve created the starter pack, tap on the title to add stickers. The only drawback I felt using the app was that you could only create one sticker at a time and couldn’t use multiple images at once. First, you set the tray icon which would be the thumbnail for the starter pack and then add one sticker at a time. Tap the highlighted icon to begin creating stickers. The app gives you two options, use an existing image, or take a new one. Once you select the image, it opens the editor and you can crop the funny faces by scribbling the outline with your finger. As soon as you let go of the finger it captures the area and cuts it out and shows the preview. If it looks good, press “save sticker” button, or try again to select the area for the sticker. You can add up to 30 stickers in one sticker pack and once you’re satisfied with the stash you can publish the sticker pack. The pack should at least have 3 stickers or else it won’t publish your pack. After publishing the sticker pack, it prompts you to add the pack to WhatsApp, tap Add button and you’re done. Go to WhatsApp and open a chat window. Press the emoji icon on the bottom left of the window and tap the stickers icon from the bottom. Now you’ll see the thumbnail of your custom sticker and you can tap it to see the list of your custom stickers. You can send it to your friends and have fun.